For Easter we had Honey-Baked Ham. I tossed the bone in the freezer, with plenty of meat on it, for soup making. I was going to make Split Pea Soup, but instead made soup with pinto beans that my mother-in-law suggested. It was a hit. Drain beans. Place in pot. Add onion, garlic, hambone, carrots and celery. Fill pot with water. Bring to boil, then cook on low for a couple of hours. Add water if necessary. 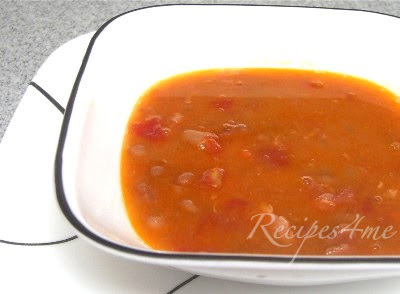 When beans are tender, remove meat from bone and put back in pot. Add tomatoes and a grated carrot. Cook an additional hour. My mother-in-law doesn't add any celery or carrots during cooking. At the end she adds only the can of tomatoes and 1 grated carrot. She make sure there is also plenty of crusty sugar included from the outer of the honey ham. I couldn't resist adding the celery and carrot in the beginning and didn't really have the sugar crust. Can be done in a slow cooker, but I've had trouble with pintos not getting soft enough. Never salt pintos until they are finished cooking, as it tends to make them hard. I'd cook it on high in the slow cooker for 6-8 hours.